We updated Faculty Websites to WordPress 4.9.2. WordPress 4.9 is a feature release with some useful enhancements. You can preview and change themes directly from the customizer. View all of the installed themes in the preview panel and click “Live Preview” to load them in the customizer. You can adjust the settings in Live Preview before committing to any changes. 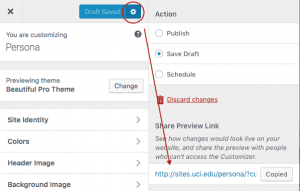 WordPress 4.9 has made some improvements to the customizer tool. 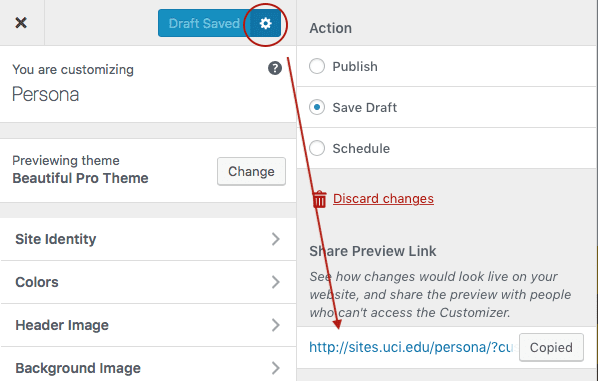 Changes can be saved as a Draft instead of committing to them by Publishing. You have the option of sharing a Preview Link with others. They don’t need a login to your site to view the changes. You can also Schedule the changes to take place automatically at a later time. Have you ever wanted to add an image gallery to a widget area? Now you can using the new Gallery widget. Simply add the widget to the desired widget area in your theme and add images or other media files from your media library. The Text Widget now includes an Add Media button so you can images or other media in a widget area along with your text. Previously, you still had to include some HTML. Previously, automatic embeds did not work outside of the Post and Page areas. Now you embed video directly in a Text Widget. Just add the URL to the video on its own line, the same way you do in a Post or Page. WordPress did not allow shortcode execution in text widgets, until 4.9. Now you can add shortcodes to a Text Widget and WordPress will display the code the shortcode is rendering. We hope you enjoy the new features. If you have questions or run into issues, please contact the OIT Help Desk and someone from the Faculty Websites Support Team will assist you.